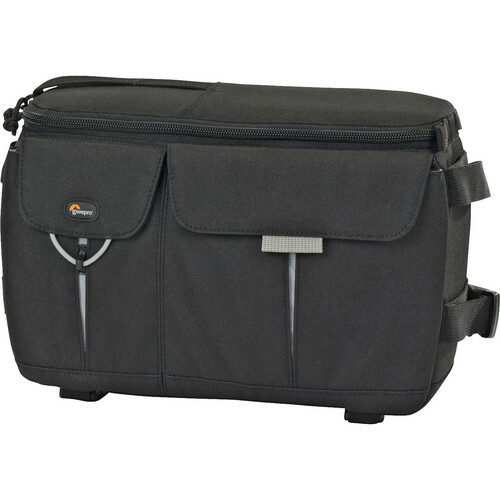 Box Dimensions (LxWxH) 12.4 x 9.1 x 6.1"
Photo Runner 100 Shoulder Bag (Black) is rated 4.4 out of 5 by 25. Rated 5 out of 5 by Tim from Great for M 4/3 kit Carry Panasonic GH1 with 14-42, GF1 with 20, 45-200 and 2 other pieces of legacy glass all in this small case. Rated 3 out of 5 by Anonymous from Fanny Pack! If you like fanny packs, then this is the one to get. It's a great little bag for a small DSLR or Mirrorless camera. Don't expect to fit anything larger as this one's meant to be compact in size. This works great for my Sony NEX-7 though when I want to go hike with my camera and a tripod. The only drawback through is that there's no rain/weather-cover like most Lowepro gear. And because I use this more for hiking purposes, I had to give it only 3 stars. But if that's not a concern to you, it's an excellent bag to have. Rated 5 out of 5 by Anonymous from Practical Simplicity - Love It! Over the past few years I have been a total Think Tank bag client and currently own a Multimedia 20 bag and the Airport International for when I travel. I bought this bag primarily for two reasons. First, to get away from shoulder bags and shift my weight down to my waist with a belt pack. Second, most of the pro-level bags out there are simply too big for when I go out to shoot with my Leica M9 and a spare Leica lens. Yes, I do have a couple of small Billinghams, but they are exclusively shoulder bags, which for a city/travel photographer who spends anywhere from 4-5 hours at a time out there shooting, is no longer a practical solution for me. The Photo Runner has been a godsend. Not only it hangs comfortably around my waist, but its light weight and simple compartments allow me to travel with minimal gear for a whole day of shooting. Typically, what goes into my bag is a Leica M9, a 50mm Summicron lens, a 28mm Summicron lens, 2 extra memory cards, a Leica CF-22 flash, and a Sekonic L-308dc light meter. Inside the front two pouches I generally keep my wallet, some business cards, a cleaning pen, and one extra battery. It all fits very nicely inside this bag. Oh, and tied to the inconspicuous two bottom straps I usually tie my compact Gitzo carbon 6x travel monopod too (model GM2561T). But not all is perfect, so here are a few things I wish this bag had. First, a common string that would allow me to open the 2 top zippers pulls at the same time without having to do one at a time. Second, an outside pocket or sliver on the back for quick access of such things as metro cards would have been nice too. But these are minor things and do not detract from this wonderfully compact, walk-around-town bag. Rated 2 out of 5 by Pulseimages from Not For The Pro Photographer I bought this bag after seeing it on the Lowepro website where it was described as designed for both the enthusiast and pro photographer. I was excited to use this bag for upcoming weddings because it is very compact and was advertised as being able to carry a DSLR with 80-200mm lens attached horizontally. After putting in my Canon 40D without/Grip vertically and the 17-40 L lens attached and a Canon 580 EX II Flash next to it, it became obvious that this bag was designed with the prosumer in mind and not a pro. The bag bulges on the sides because the Canon 40D is too big for this bag. Thus the bag becomes difficult to zipper shut and the handle always gets in the way when zippering even with the bag empty. This bag is designed for the Canon Digital Rebel series and similar sized cameras. I even tried putting the Canon 40D in the bag horizontally with the 17-40 L lens attached and it continues to bulge on the sides and doesn't fit well at all. The most I can carry in this bag horizontally is a Canon 70-200 2.8 L lens with hood reversed and with no room in the main compartment for anything else. I tried the waist belt and it fits well. Nice and tight when the bag carried in front and on the sides. When I tried to carry the bag with the bag on my back the compression straps kept becoming loose. The storage of the waist belt is a nice idea but the straps kept slipping out unless you tie them up and buckle the waist belt together. This bag is advertised to be a bag for everyone but fails when it comes to the pro photographer. If you own a prosumer camera and lenses then this is the bag for you. If you're a pro then stay away. Rated 5 out of 5 by DougC from EXCELLENT BAG Just right for a non-pro body and lens plus extra space for a second lens or flash. Well padded with well thought out pockets for extra media cards and small accessories. Rated 5 out of 5 by Anonymous from Great Camera Bag Perfect size for 1 camera, 2 lenses, battery, and memory cards. Not too big and not too small. Wanted a waist bag and this one is great. Rated 5 out of 5 by ayoshi from Great for 2 lenses and a body I love my Photo Runner 100. After a year of use, this is what it is good for: I have a 60D body plus a bunch of lenses. I have 3 different size bags from the Photo Runner (smallest) to full backpacks. The Photo Runner is by far my favourite, however, I can only use it in situations which require 2 lenses. I can put 3 in a pinch, but then am unable to quickly take out the camera. A 60D with my 24-105mm lens attached, plus another medium to small sized lens (say a 10-22mm or 100mm macro) is perfect for this bag. I can place the camera in horizontally, allowing me to grab it by the grip for easy and quick retrieval. The bag is lightweight, convenient, and protects the equipment well. Downsides: Know that this is not a very large bag. You can only get 3 lenses and a body in it if the lenses are smaller (like a 50mm, etc). It fits 2 great but anything more would be pushing it. Also, the front pockets are useful but also not very roomy. Overall I love this bag. The only situations I don't use it in are when I absolutely need 3+ lenses, or additional accessories like chargers and flashes, etc. If you are looking for an easy to take around, well built, and convenient bag for your DSLR body + 2 lenses, then this is the one for you! Rated 5 out of 5 by exformant from Great for light loads. I carry a very small kit around (GF3 or GH2 with a lens attached plus one extra lens) and this works perfectly. I don't bring a lot with me, so I stuff the ample extra space with old clothes for extra padding. It's lightweight and comfortable and it works just fine for me. Only thing I would say is, if you're not using the fannypack straps, it's hard to fit them in the back pocket as snug as they were when it came. But, that's not the bag's fault.